3/26/2006 - AHF of Washington, DC's annual 1848 commemoration. 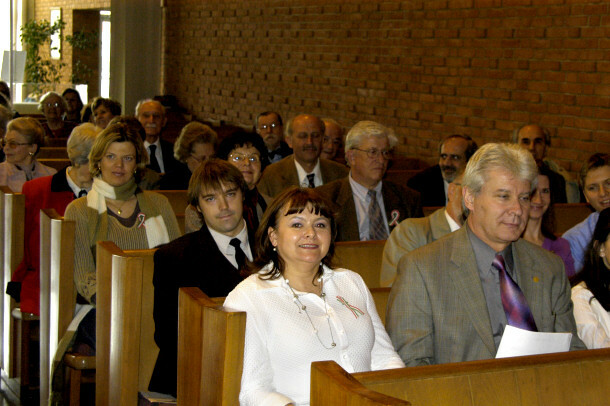 The Chapel at Wesley Theological Seminary at American University in Washington, D.C., was the setting for this year's commemoration which featured speeches on Louis Kossuth and the implications of 1848 on recent Hungarian politics and ethnic relations in the Carpathian Basin. Zoltan Bagdy, master of ceremonies, opened the event and invited Bryan Dawson-Szilagyi to lead the national anthems of the US and Hungary accompanied by David Purger. Hungarian Ambassador Andras Simonyi delivered the opening remarks and was followed by a performance of the "Rákóczi Induló" (Rakoczi March) by child prodigy Szollös Sebestyén. 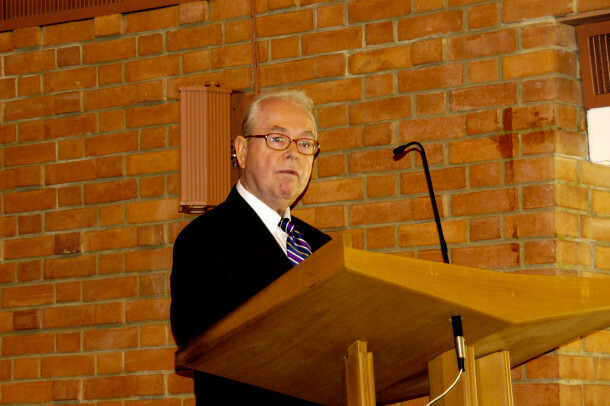 Frank Koszorus delivered his speech "Kossuth in America" [downloadable here]. Koszorus remarked, "As we see from Kossuth’s incredible speech, the concept of local self-government has been an integral part of Hungarians’ proud tradition, cherished by them not only today when part of the nation lives scattered in countries neighboring Hungary, but also when Hungarians lived within one border." Bárczay Sári, of the Bátori József Hungarian Scouts, presented the Nemzeti Dal to be followed by the entire 4th scout troop who performed "Emlékezés" (Remembrance). 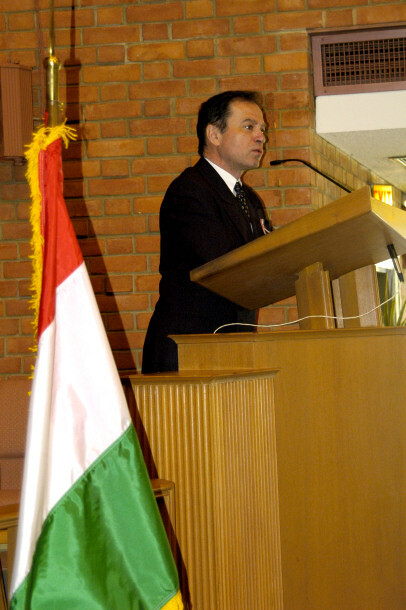 The keynote speaker was Andras Ferenc Bodor who remarked, "Én ahhoz a generációhoz tartozom, amelyik a márciusi ifjak forradalmi attitudjét 1988-89-ben vitték a budapesti utcákra a kommunista diktatúra hatalmi gépezetével szemben. Ezzel a generációval szebben bánt a sors, nekünk nem kellett az életünket áldoznunk a harcunk sikeréért, és nem kellett a hazánkat elhagynunk egy elbukott - mondhatnánk, hogy csak a hosszútávú hatásában gyoztes - harc után." [download his speech here]. The event was closed by a stirring speech Rev. Gábor Nagy. Learn more about the Hungarian Scouts and the May 20th Gala Fundraiser to benefit AHF and the Bátori József Hungarian Scout Troop of Washington, DC. Audio and text of the Kossuth Anthem, "Kossuth Lajos azt Uzente"
"Kossuth in America" by Frank Koszorus, Jr.
"the house of Habsburg-Lorraine, perjured in the sight of God and man, had forfeited the Hungarian throne." "All for the people and all by the people. Nothing about the people without the people. That is Democracy, and that is the ruling tendency of the spirit of our age." Kossuth Lajos (b. 1802, d. 1894, pronounced co-shoot luh-yôsh) was Governor of Hungary during fight for independence and democracy which was eventually defeated by the union of the royalist Austrian Habsburg and Russian Czarist Armies (1848 - 1849). Kossuth envisioned a federation in the Kingdom of Hungary in which all nationalties participated in a vibrant democratic system based on fundamental democratic principles such as equality and parliamentary representation. The bloody conflict eventually led to a great compromise known as the "Austro-Hungarian Empire," in which Hungary gained some autonomy. although Kossuth would have no part in it and demanded full indepependence until his death. The speech from which the above excerpt is taken was given over a decade before Lincoln's famed "for the people, by the people" speech given at Gettysburg in 1863. Kossuth was the first foreign Statesman officially invited to the US since the Marquis de Lafayette. His upcoming speech in the Congress of the United States made the pre-civil war joint house nervous due to his democratic views on equality of all men. Kossuth learned English while in prison and exile and spoke to half the population of the US who enthusiastically greeted and flocked to hear him. Despite Hungary's epic struggle and Kossuth's brave and noble efforts, the US, the "Bastion of Democracy" turned him away, empty handed. Hungary was alone again in its fight for democracy in 1956, and didn't gain freedom until 1989. Today, there are many reminders of Kossuth's impact on America and the world. In North America, there is a Kossuth County in the state of Iowa, a town with his name in Indiana, Ohio and Mississippi, a settlement with a Kossuth Post Office is in Pennsylvania. In addition, there are Kossuth statues and plaques in New York, Cleveland, Akron, New Orleans, Washington, and Ontario, Canada. The Hungarian Reformed Federation's building on Dupont Circle, in Washington, DC is called Kossuth House with a memorial plaque commemorating his speech on democracy. See the picture gallery and memorials on Louis Kossuth in North America. "[we] have been hungry to see the man whose extraordinary eloquence is seconded by the splendor and the solidity of his actions." 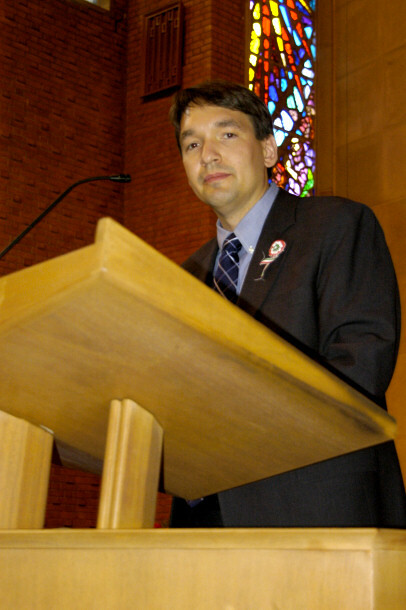 Hear Louis Kossuth Speak! [Click Here] - This is the speech of Louis Kossuth which he gave for the dedication of the statue for the 13 Hungarian generals, who were executed at Arad, Hungary, on October 6, 1849 (Arad is in Rumania today after annexation due to the Treaty of Trianon in 1920 ). Louis Kossuth was exiled after the fall of the Hungarian Liberation Fight of 1848 and made his permanent home in Torino (Turin), Italy. He could not attend the dedication of the monument at Arad, without risking arrest, so he recorded his speech in Turin, and sent it to Arad using the new technology of sound recording, called the phonograph. The recording was made on September 20, 1890, when Kossuth was 88 years old. It is a sad fact that the monument Kossuth sent his speech for was torn down by the Rumanian government when they annexed Transylvania, along with Arad, in 1920, after World War I. "A világ bírája a történelem fog e kérdésre felelni. Legyenek a szentemlékû vértanúk megáldottak poraikban, szellemeikben a hon szabadság Istenének legjobb áldásaival az örökkévalóságon keresztül; engem ki nem borulhatok le a Magyar Golgota porába, engem október 6-a térdeimre borulva fog hontalanságom remete lakában látni a mint az engem kitagadott Haza felé nyújtva agg karjaimat a hála hû érzelmeivel áldom a vértanúk szent emlékét hûségükért a Haza iránt, 's a magasztos példáért, melyet az utódoknak adtanak; 's buzgó imával kérem a magyarok Istenét, hogy tegye diadalmassá a velõkig ható szózatot, mely Hungária ajkairól a Magyar Nemzethez zeng. Úgy legyen Ámen! "The judge of the universe, history, will decide over this question. Should the saintly remembered martyrs be hallowed in their ashes, in their spirit with the highest blessings of the Lord of Liberty and through eternity; I can not pay my sympathies to the ashes of the Hungarian Golgotha, but October 6 will find me on my knees in this reclusive home of exile, as I open my arms to my disowning homeland. 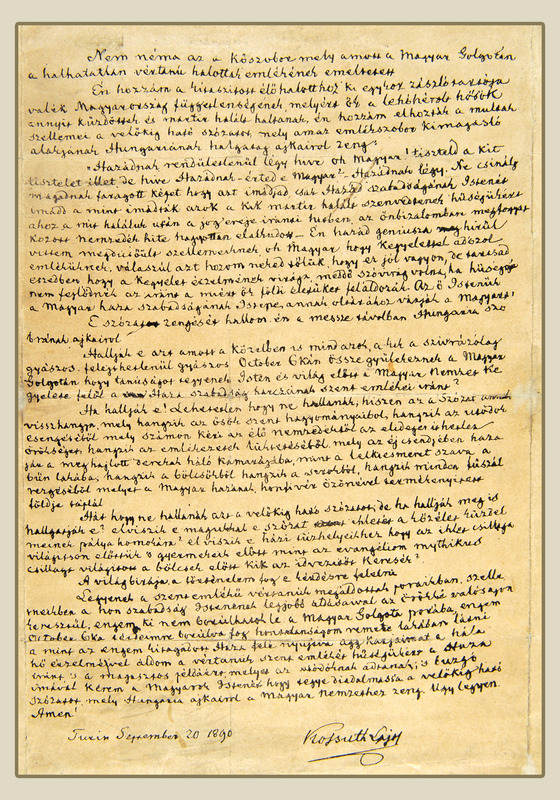 With gratitude's faithful sentiments, I bless the martyrs' sacred memory for their faith in their homeland and for the sublime example they left to their heirs: with ardent prayer I beg the God of Hungarians to make their appeal which echoes from the lips of Hungaria to the Hungarian Nation. So be it, Amen! Wikipedia - [visit] and add your thoughts!